EU President Donald Tusk tweeted at around 5 am local time from Brussels this morning that after a marathon session, all 28 member states had found the necessary compromise on the issue of immigration, for which mostly Italy (as well as other states) had been demanding. 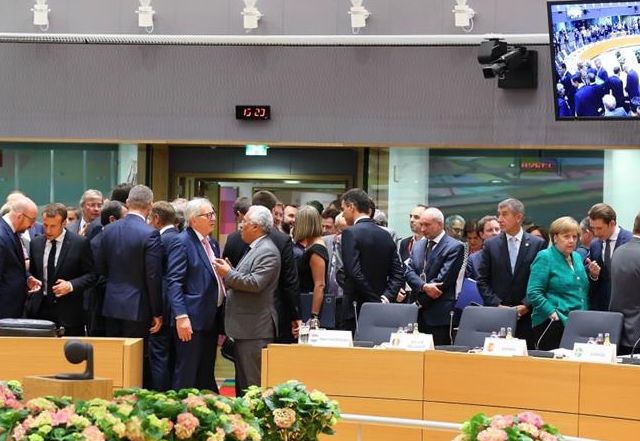 Mr Tusk wrote: "EU28 leaders have agreed on EU Council conclusions including migration." The deal foresees in setting up closed reception centers outside the EU (a proposal made by Austrian Prime Minister Sebastian Kurz) where migrants will be screened beforehand to see if they are eligible for asylum in the EU. Furthermore, any EU country willing to set up reception centers within their borders would get financial aid from the others. German Chancellor Angela Merkel was glad to be able to report that leaders had also agreed to stronger internal checks to stop asylum seekers from freely choosing an EU country in which to apply for asylum, meaning that they can’t automatically go to a country of their choosing (Ms Merkel was under pressure from within her own party to deliver such a solution as Germany has been flooded with immigrants in recent years). French President Emmanuel Macron, who emerged as a strong ally to Germany’s Angela Merkel, claimed that "It is European cooperation that has won the day." "Europe will have to live with migratory pressures for a long time. We must succeed in standing up to this challenge whilst being true to our values." "After this European summit, Europe is more responsible and offers more solidarity." Mr Conte had refused to sign an earlier draft of the agreement as he wanted all 28 member states to help with the great number of migrants arriving in Sicily. In recent weeks, Italy’s Interior Minister Matteo Salvini had forbidden several ships from docking in Sicily, leading to an EU-wide crisis.